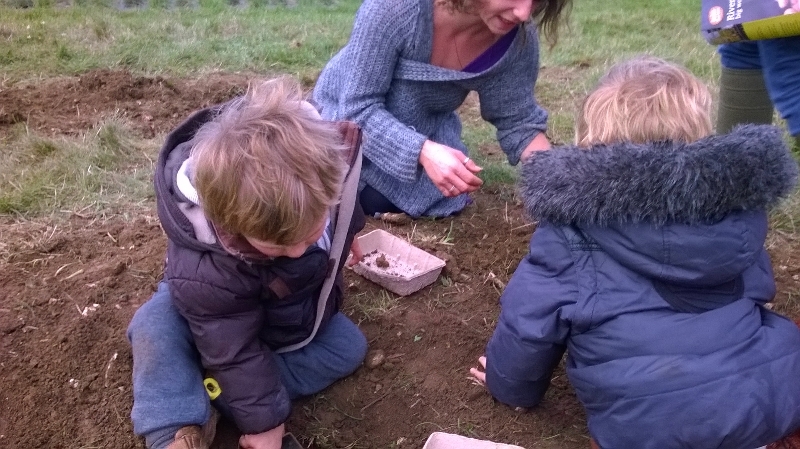 We were over joyed to discover that Riverford had an area for the big worm dig at the Upper Norton Farm Pumpkin Day. As part of a science project to learn more about our soil and the worms among it Riverford set up the ‘big worm dig’ with the intention of getting everyone digging! We intended to help and get stuck in and that’s just what we did! After our efforts at home did not go exactly to plan, being totally mind blown by the variation of Worms that were possible to find and the minor differences between them we were relieved to discover we could still get involved with the help of an expert at our local Riverford farm! Yay! I just adore the vision of children getting close to nature and covered in earth whilst discovering what our planet really is. Mud washes off! The amount of fun that can be had from just playing in the dirt is amazing. Mud can become anything to a child, stack it up to be a castle or a tower, dig a hole to fill, make people figures or even bury treasure under it! Quite simply mud is life, we eat what grows from the mud of earth then we reproduce and grow using nutrients from the earth, the earth is where our bodies rest and breakdown into when we pass, our body becomes the mud which feeds another, the cycle is continuous making mud life and a huge part of it! 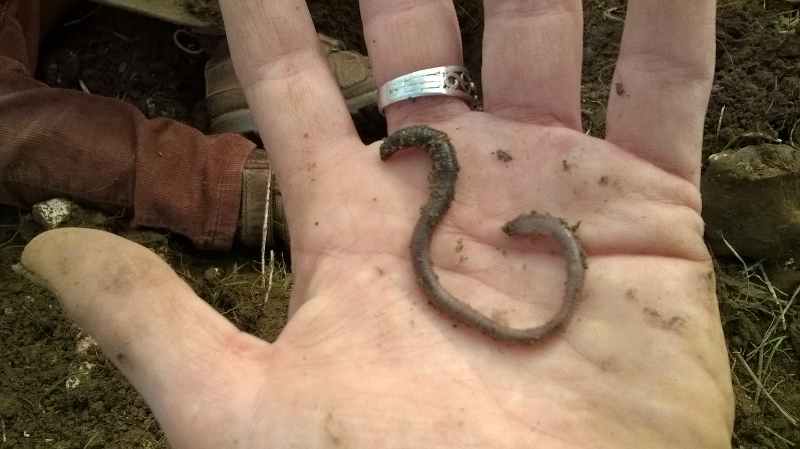 Earth worms breathe through their skin whilst they protect our soil preventing soil erosion. They intake organic matter from all around them, they consume it and excrete it incorporating it into the soil allowing the plants roots to better absorb nutrients and grow more successfully. There are 4 ecological groups of earth worms and they are: the composters, the litter dwellers, the soil eaters and the deep burrowers. To find out more and to get involved visit Riverford online or visit your local farm. Once we had decided a time to take part in the big dig, we made our way over to the designated digging area. It was welcoming to see so many families taking part and was a true joy to watch all the little children getting covered in mud looking for earthworms. There was a slight shortage of shovels as there was so much interest although it wasn’t long before we were handed some to use. The boys had a shovel each and both also had a pot to place the discovered worms into. It was lovely seeing the boys dig and although they found it quite tough they still enjoyed tossing mud everywhere and greeting the Worms we did find. The children were very sharing in this task and both Aunty Nat and I actually got a go at digging! Mummy’s knees were nice and muddy by the time we were done, it was totally worth it, I think Easton and I found 7 worms and luckily the ‘Worm Man’ was on hand to help us identify them. Unfortunately the majority of the worms were too small even for him to identify. Alas we had one chunky one that was identified most confidently as a black-headed worm! Woo hoo we had found and named one worm even if it were only that one! It was a beautiful day and it hadn’t rained much the night before so the ground was slightly dry to have an abundance of wriggling worms. We gave it a good go and when the kids had enough we gave back the shovels, thanked the man for his help, washed up and set off for the ferret racing! 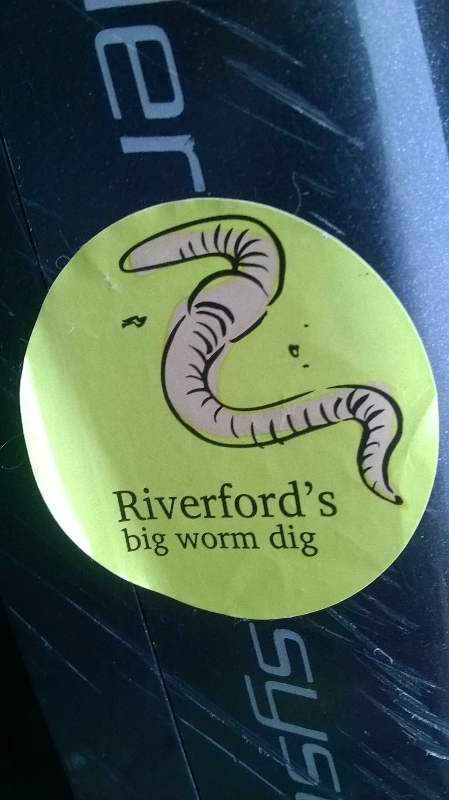 I know the worm dig is in the name of science but I would love to thank the promoters at Riverford for bringing such a new fun activity into my family as this can be enjoyed throughout the whole year after a good dose of rain! The kids can get physical digging and can understand the importance of taking care of the earth and being kind the the creatures in it. Mud, mud, mud, I love mud, I always say, the more mud a child has on him the more fun he has had! Bring on the mud bombs? Amazing! I just loved to see the amount of people interested in organic produce last month. Its awesome! Whether they are regular buyers or just curious to the farm day out at Riverford, seeing that many people that care about what they consume was truly comforting. It was eye opening for me to see where most of our weekly budget goes and the kids just adored the animals and variety if squash all around. 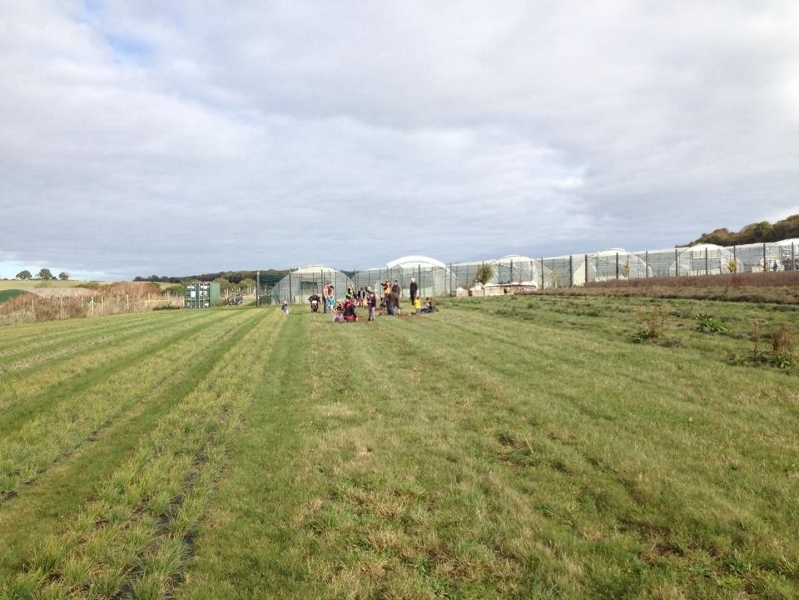 After admiring the first glimpses of the farm site and browsing the stalls we walked outside where they were doing carpenrary, it was inspiring to see that it was a hit with the older children and I hope one year upon returning my boys will be at the level they can fully appreciate it and have a go for themselves. Passing many adorable and magical looking squash we stopped and the boys got to see an Owl up close that opened his beautiful wings and really showed off his cheeky personality. Next to him were some sleepy ferrets looking so snug and cozy and alongside them were more ferrets awake and ready to race! We took a stroll down to check out the worm dig with intentions to later return and along the path were the most delicious silky lettuces I have ever tasted…so good to see where they grow! After checking out the whole place and working out what was where we showed the boys the beautiful Horses that help humans by pulling a wagon cart. I had promised the children animals and taking a trip in the cart seemed a perfect way to show them how humans and animals work together as well as enjoying a bumpy ride. They really enjoyed being on the wagon and adored the little dog that was on board with the driver. The horses were so graceful and did indeed look grand standing next to the boys. It was lovely for the boys to stand next to and observe the size of a real tractor and amazing for us all to see the sheer size of the enormous combine harvesters. We admired the face painting and did plan to get some done but it was so busy and we could think of much more things to do than que up for over 30 minutes so we opted out and indulged in some amazing chocolate and courgette (dairy and gluten free) brownies, wow, they were good! We really wanted to try the worm dig so we headed back outside to spend some time helping discover different breeds of worms! The kids loved having a dig with the shovels and even let Mummy have a go and in total we found about 7 worms and one was large enough to identify as a dark tipped worm. We stayed for a while, got covered in mud, cleaned up and just as we reached the top of the field thee ferrets were getting ready to rave. Awaken from there sleepiness four ferrets, Taz, Tiz, Ivy and Fern were lined up waiting to go out. A couple were showed around nd the boys got to stroke them and say hello. We placed a bet on the green caged ferret called Fern and although she didn’t win it was a cute experience for the kids and roaring fun for the lively parents. After the race we considered the pumpkin carving and it was rather busy and the boys were slightly restless so we purchased a large pumpkin and headed back inside. We had another wander around and it was packed full of people in the warehouse, happy vibes! My friend really enjoyed the cheese stall and purchased some goat’s cheese and I admired the ‘give a pet a holiday’ team and found out how I can get involved. There were so many beautiful veggies everywhere and some absolutely stunningly crafted items for sale. We decided we would go over to the lady carving wooden pencils and my friend said she would love to buy some for the boys so her and my eldest joined the que there. It was my turn to buy the next refreshments, my youngest boy and I headed off to get some cake and upon reaching my friend I remembered the stall selling hot Apple juice which we had earlier tried and I had previously thought if the mulled wine is anything like the Apple then it is a must. Upon reaching the stall it dawned on me how much of a good idea it would be to actually get some so we did and it was amazing, so delicious, mouthwatering and tasting, so comforting and warm. Just what a busy woman needs after a mission with 2 young boys! For the pencils the lady scorched the names required into hand carved pencils, they were very beautiful and a great idea! We gave thanks, admired the beautiful abundance of produce and organic people and made our way back outside. It was indeed a packed event with thousands of people who attended and the queues reflected this. I buy weekly from Riverford and will continue to do so until I have my own patch. Thanks to everyone for a wonderful day out. We will definitely be back next year! Turn your childs favourite toy into a glow in the dark wonder! What a fantastic and festive idea! Although these are great for Halloween they are also super ghosts for anytime of year! * Take your toy and wrap a few layers of cling film around it, covering the entire toy. * Wrap sticky tape around the toy until it becomes a solid casing (you will need a lot of tape for this). Do as many layers as you can. In the dark they will illuminate and appear as little ghosts in the shape and form of whatever figurine or toy you chose! Hang them around the house or garden to give a spooky feel to any enviroment. When the glow stick has faded simply cut them out and re-insert when required. 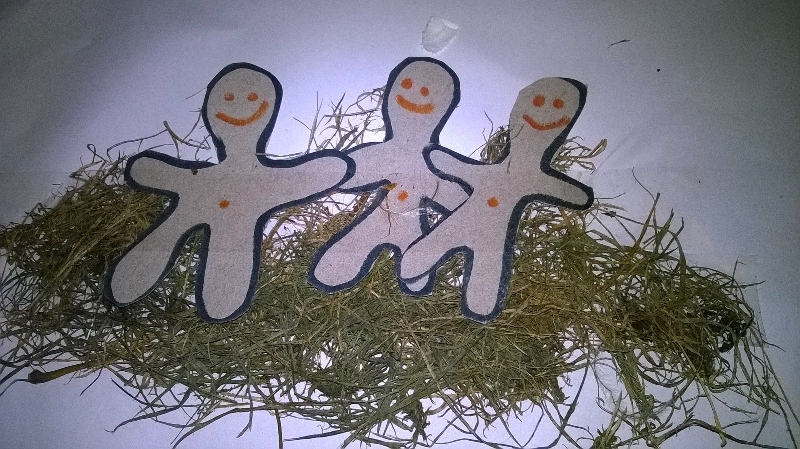 What a great and simple way to set off a creative flare within your children, designing and making your own little people. Having the children draw in their own detailing and possibly naming the figures helps the child become more involved in the activity encouraging them to deeper relate to the characters. It teaches them through demonstration and aids understanding of the nature of people, their features, expressions, activities and moods. We created several backgrounds for the figures to explore various places from all around the world outside of a home. We also role played in these places to teach the children what people do at each place. We used a collection of natural items we foraged from the woods on a previous outing to give detail to the backgrounds. This taught the children about using objects for different uses and brought out pictures to life. The varieties of people that can be created and the background scenes that can changed about are of no end. The imagination can really be exercised. All you need is paper, card and some colouring pencils for basics. Draw the outline of the figures, cut them out. Design and create the characters. Design, draw and build the different background scenes. Take the cut out people on journeys into the different scenes to create a wave of learning through imagination for your children. Anything can be incorporated into this art to create a lively background scene, for example the nature items or what about fabrics, dried foods like organic pasta or seeds, old pictures, used packaging etc. There’s so much diversity of inspiration out there that its all down to what you have around you and the creative mind at force. A while ago I wanted to get crafty with scenting my home. I crafted these beautiful room scents that still smell amazing today. I was out and about with my children when I discovered some tree bark and was inspired to make something beautiful with it. I took some home and had a think about what I could make. I always crave a lush smelling house and for ages I had longed for something to make the rooms pleasantly scented as well as be aesthetically pleasing. My friend had gifted ne some lavender and I used this for the design base and fragrance. I took out the collected bark and added glue to the areas I required it. After doing so I added the lavender into place. From there I removed some crystals from an amethyst and a peridot tree that I had. Once I was happy with the design I took some of the nag champa incense dust I had been collecting and sprinkled it over the top and left it to set. Before I knew it I had crafted what my house was in need of and was more than happy with the results. 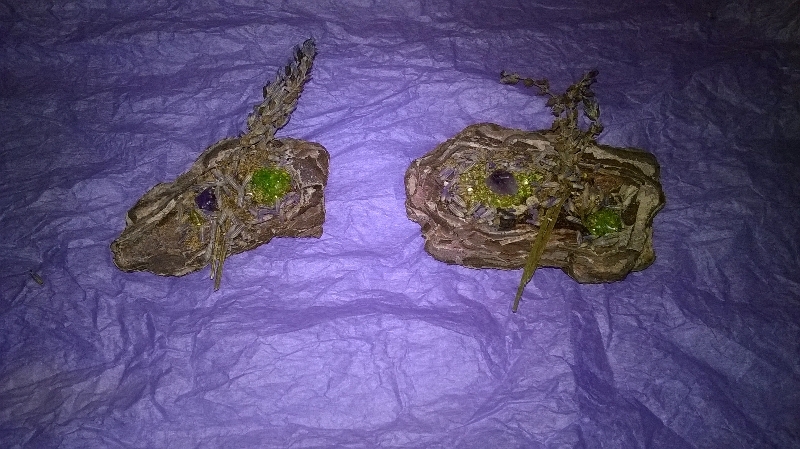 I made a few similar pieces using different sized and shaped bark and gave most of them away as gifts. To keep these ornaments well scented with an extra boost, like potpourri, essential oil drops can be added now and then. The oil soaks into the dried flowers and wood and gives a delightful aroma to any room. This kind of crafting sparks off inspiration to do much larger pieces of art work for ornamental purpose by using these kinds of resources. The possibilities are endless! Crafting pieces for your own home allows you to build up good, positive energy that you can feel more intensely in the areas of placement. For the first time in my life my dear sister actually said she could feel good vibes, positive energy and love within my home! I was overjoyed, finally I realised I am getting there. My home is indeed filled with so much love bursting from the seams and creating little ornaments is a great way to control and channel that love in a productive way. I just love to have the time to sit down and craft something magical for someone I love. For me crafting started with making cards, I was looking for a more personalised and heart touching way to gift words to the ones I love so I got together a kit and went from there. I found much satisfaction in re-using parts of old cards I had been given like the pictures and parts of decoupage that many people just throw away. I see crafting gifts as a sustainable way of using paper and such alike when gifting others or making things for around the home as many creations can be made from things already around the home that are more than likely to just be sitting there for ages. I began finding many cards too beautiful to just bin and was determined to find new uses for them. This I will still do occasionally although now my favourite way of card making is with pieces of nature, old leaves, dried flowers, fruit and vegetable skins and gem stones etc. 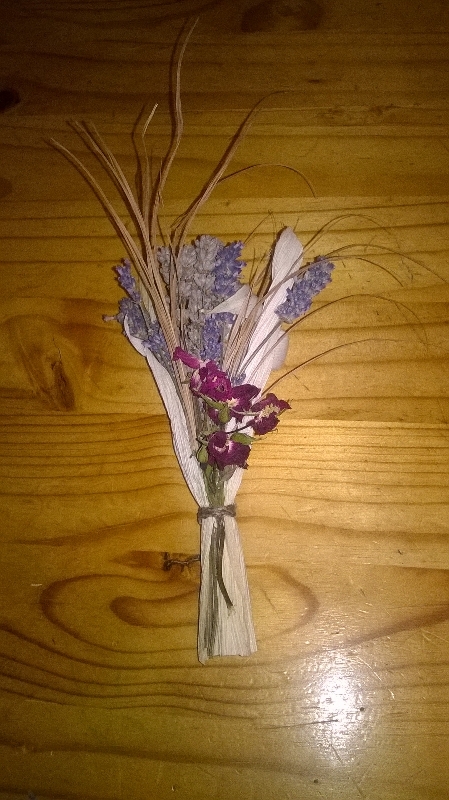 I also love to craft bunches of home dried flowers to gift. To tie these bunches together I have found hemp cord to be an amazing resource. It is strong, beautiful and lasts for a respectable amount of time whilst saving the trees! Hemp cord has so many uses, an extremely versatile fabric and plaiting three strings together gives extra strength wherever needed leaving a really pretty effect giving presence of effort and care. It can be sown into cards, along the edges for a beautiful eye catching and detailed effect, it can also be made into many shapes to create images. I feel home crafting, cards, flowers and gifts is an excellent way to project your love and emotions for that person showing how much you care for them. Whilst crafting away, the time, effort and care you use, puts your energy, part of you, into what you are making and upon that person receiving the gift they are able to feel your energy making it the most personal, powerful and effective way of giving gifts of love to the people you care most about. This, being the first time I ever tried the wonderful veg that is Radicchio, I was filled with excitement of discovering a new and, as promised, tasty dish. The farm I buy my organic produce from is simply divine and gives out recipes with each box you purchase. I have major intolerances to certain foods, garlic (really…did it really have to be garlic?!) and sugar being two of the most irritating, therefore the recipe gifted along with the Radicchio was out of the question. Nevertheless I was not about to give up there; this magical veg was going to be enjoyed! The sauce in the Farm recipe was rather a sweet one to say the least and I decided to stick to that theme when adapting this dish to my own requirements, simplifying it majorly using ‘safe’ ingredients that I had available. In fact I didn’t even use one ingredient listed and just yielded the inspiration to get creative! My boys were having Crown Prince Squash Cake for dinner (which again I cannot consume due to nearly all the ingredients, bar the tatties and squash, setting my stomach off in agony), I adore squash too and that’s when I decided to join it with the radicchio. I am so glad I did this, it was amazingly delicious and the ingredients complimented each other beautifully, sitting perfectly together. 1) Bring a pan of water to the boil. 2) Section the squash and remove the skin. The skin is quite a tough one so I recommend cutting it away with a sharp knife rather than trying to peel it. Dice the whole quarter and place it in the water. Cover the pan and reduce the heat. Simmer for about 15 minutes. 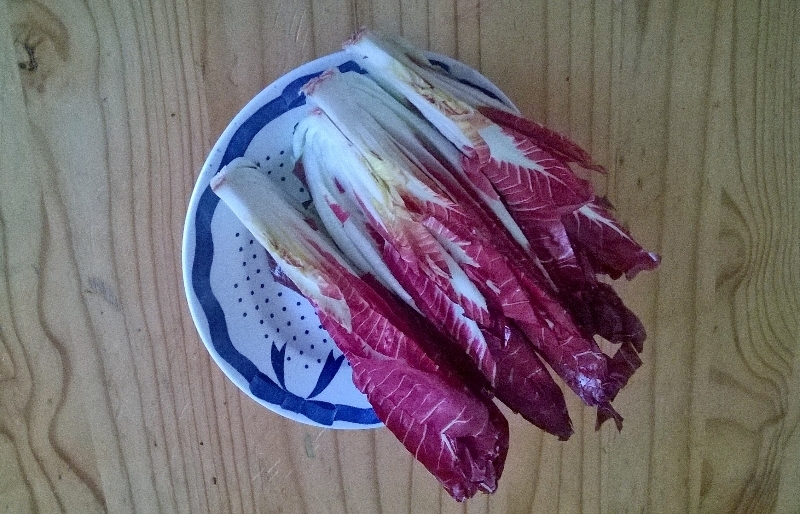 3) Cut a fresh radicchio in half and then section it into quater slices, length wise. 4) Turn on the grill and cook until both sides of radicchio have browned. 5) Remove the squash from the pan and mash or blend until puréed. 6) Measure out the balsamic vinegar and salt, add it to the squash and purée a little more until it is as smooth as it can be. 7) Plate up the radicchio and top it with the sweet squash. There you have an absolutely mouth watering plate of food that is quick and simple to make and a joy to devour. What a pleasure it is to reveal to you the exact life changing, eco conscious benefits of using cloth nappies. I, personally was very disheartened to have not been using them right from the start of my first babies birth. I did not have enough knowledge of what it would require and had way to much ego preventing me from the beauty and care in using reusable diapers. I shudder to think of my actual contribution to landfill sites over previous years and the disgraceful collective contribution that is of todays world caused by the use of non biodegradable nappies. I mean seriously what on earth are we thinking, if we continue in this way we will literally be living on a waste ridden planet, there is only so much space to fill before it becomes our home. Luckily now we have companies such as Beaming Baby which provide biodegradable nappies being a huge step for saving the earth. 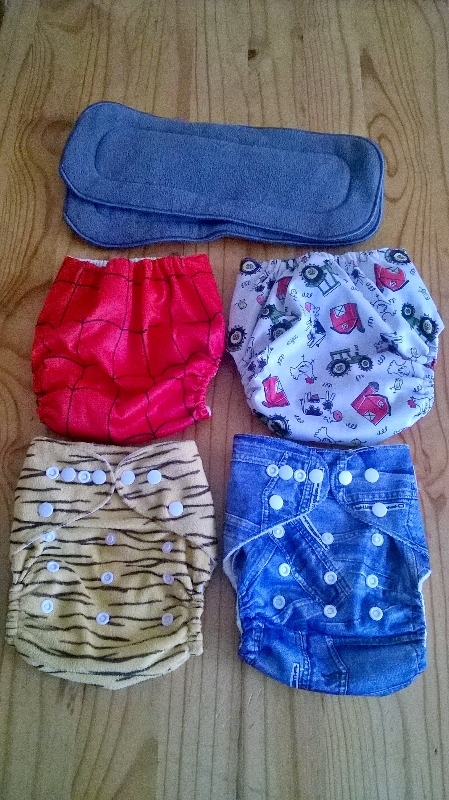 I do use these also when needed, in times such as when the cloth nappies aren’t dry or for heavy bed-wetting, mainly I love to reuse cloth diapers. Using cloth nappy diapers is the most eco friendly way to go, it costs much less money as you only pay out once, you never have to worry about running out of them or restocking and you can attain the most beautifully designed nappies that are kinder to babies skin. I would recommend having at least 15 cloth nappies for one baby to ensure you always have enough although the amount you will need depends of how often you wash them and how quickly you can get them dry. It is the paleo way and the most natural way to care for your babies waste. You use the nappies, wash them out, store them in a wet bucket for upto 2 days then pop them in the washing machine or thoroughly handwash them. Simply hang them out to dry and reuse them. No waste is created and you can live knowing you are doing more to save the earth. Using a laundry detergent, such as my homemade laundry powder, along with a cup of organic white wine vinegar keeps the nappies smelling fresh and feeling soft truly caring for babies skin. Cloth nappies are gentle on the skin and comfortable for baby, causing no unsettling itch or rustling sounds that come with standard nappies. They come in a variety of fabrics and designs and good ones can be size adjusted to get a perfect fit for your little one. Using liners inserted into the shell the diaper becomes absorbant and protective in those messy moments. They can be purchased using different fabrics such as bamboo velour, microfiber cotton or PPL, it is all down to personal preference. Personally I cannot get enough of the gorgeous bamboo nappies they are just so soft! I feel it is time all parents took a look at the way they care for their babies waste and the impact it has on the earth. Making the small and simple change over to reusable nappies is one of the best decisions you could ever make and gives instant benefits to baby and parent. I know I am thankful for being shown the light and I hope you will too. Thanks for taking the time to see how you can improve your babies lifestyle. If you are looking for a way to make delicious cookies that don’t require cooking then you have come to the right place. I make Almond milk all the time and am forever fussing over what I can create with the pulp, not wanting to waste it. 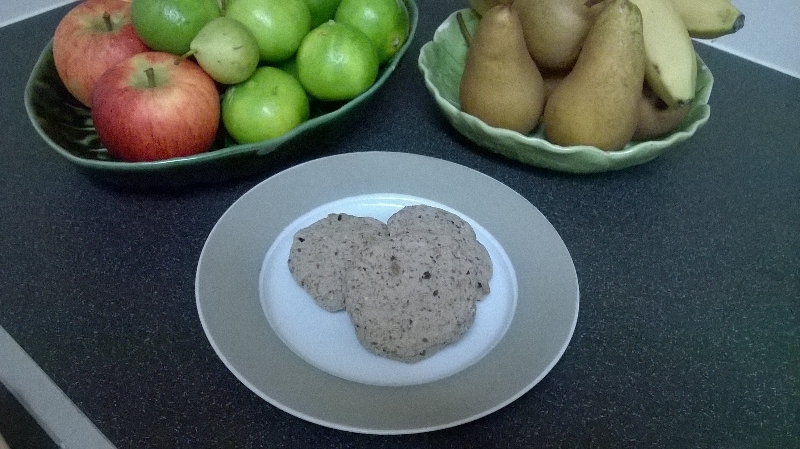 If you have been following this blog you will see all the wonderful snack balls that are possible to make from left over Almond pulp but today I was inspired by a recipe I got through with a delivery of Love and suddenly got the urge to be creative. Also having made the boys Orange shakes I had some Orange pulp to use too. Having absolutely no ingredients from the cookie recipe that came through, bar the Himalayan Sea Salt, I was still determined to finally make some healthy natural organic cookies that rock, so that is exactly what I did! I really hope this method of making cookies inspires you to indulge in other raw food methods as much as first learning the ways did me. Raw foods have changed my life gifting me useful knowledge to have.